The common law test for Defamation. Before the early 1300s, actions for the predecessor of defamation were obscure and purely within the jurisdiction of the Church courts, it was not until much later that the King’s courts allowed an action for defamatory words. The often physically-based nature of the common law was not in favour of creating an offence which rested on mere words. It was much more concerned with the tangible actions and results of, for example, assault, theft and murder. It took until the 1500s before a common law action for defamation appeared. Perhaps the key reason for this delay, as outlined above, is the fact that pre-1500, defamation was seen as a purely spiritual matter and was therefore dealt with by the Church courts. The Church courts tried Defamation as a criminal offence and could only sentence the offender to penance, admittedly quite a light punishment. This early distinction between the Church and common law jurisdictions will be examined in a later blog post. However, before this time, there were occasional actions that touched upon issues of defamation and the tarnishing of someone’s character or reputation. For example, in the 14th Century, there were actions brought by nobles who had been slandered in the King’s open courts. A judge in 1358 recovered a sizable sum of money for being called a traitor at court. Moreover, some actions were brought regarding false statements about men having second marriages, a very damaging accusation that could ruin their reputations. Around the same time, the 1378 Statute of scandalum magnatum allowed important judges and Church officials to bring an action if they had been insulted or defamed. The first common law defamation case on record was brought in 1507, where the King’s Court changed its mind regarding mere words and decided they could impact the honour of a man as much, or even more so, than physical attacks. At the time, three categories of Defamation existed: (1) Words accusing someone of a crime; (2) Words accusing someone of being incompetent at their job and (3) Words accusing someone of having a particular disease (such as the French pox). Human nature being as it is, this led to a flood of actions and various forms of defamation became the bread-and-butter work of the King’s court, becoming its most dealt with action by the mid-to-late 16th Century. In cases of 1557 and 1565, several judges made attempts to limit the number of actions by (1) insisting on the claimant proving special and real damage to their reputation; (2) words said as jokingly or in anger were not actionable and (3) by interpreting ambiguous words as less defamatory than they could potentially be. This did serve to limit the actions slightly but they were still extremely common. Several specific rules were also created, such as a man being able to bring an action even if he already possessed a bad reputation. Until 1660, the common law did not draw a clear distinction between defamation that was spoken or that which was in writing. However, defamatory words in writing were often punished with harsher sentences. The current distinction is between impermanent, often spoken, statements (Slander) and permanent, often written, statements (Libel). The current law of Defamation is broadly that an action can be brought in the High Court by a claimant if a published statement would make a reasonable person think worse of them. The actions revolve around the Slander and Libel distinction mentioned immediately above. There are several defences to such a claim: (a) Justification (where the statement is true), (b) Fair Comment (where the statement would be believed by a reasonable person) and (c) Privilege (where the statement is privileged, for example, something said in the Houses of Parliament). 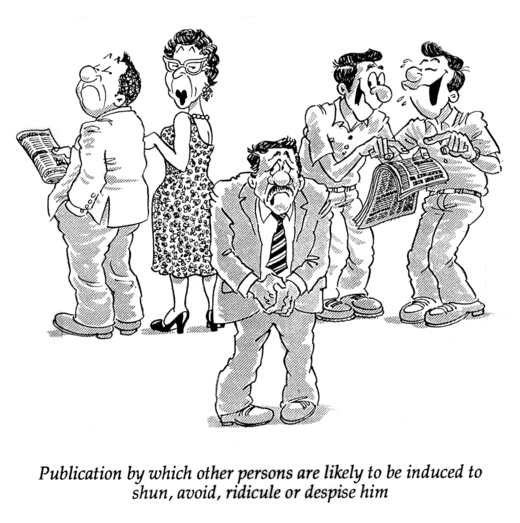 Defamation is still a very popular action and cases involving it are regularly headline news with a variety of celebrities claiming their reputation has been tarnished, often by statements made in newspapers. This modern flood of actions led to the passing of the Defamation Act 2013, which came into force on the 25th of April 2013. This Act is geared towards striking a new balance between the claimant and defendant, seemingly making claims harder to prove by outlining a new requirement of serious harm to the claimant’s reputation and improving the strength of the various defences. The Act only applies to defamatory statements after its commencement therefore the older defamation law will apply in many cases going ahead in 2014/15. 1) Bans and dooms for defamation exist going back to the oldest germanic legal codes, although they are oddly absent from early Anglo-Saxon codes. 2) My conjecture was that actions for defamation where primarily held in the manorial courts that replaced moots, although showing that was beyond both my scope and abilities. 3) Political defamation was always actionable in the King’s courts, the first statutes on the issue go back to Richard I. 4) The growth of defamation cases in royal courts is primarily a political phenomenon under the Tudors, via the disenfranchisement of the manorial and ecclesiastical courts. 5) Libel is not a organic outgrowth of defamation under Common Law, but is a bastardization of Roman law that entered England by way of the Star Chamber, see point 4, and was clumsily grafted on to Common Law defamation in response to an influx of cases before the royal court. It was subsequently justified as an implicit scienter element, for which it was never a great proxy, and has only become less so over time. I would love to send you what I wrote if it would be interesting to you, or even just to get a critique of my analysis if you would be willing. Give it a go. Having just finished T.F.T. Plucknett’s A CONCISE HISTORY OF THE COMMON LAW as text for a course I shall teach this fall, I for one would like very much to see what you have to say. That you were a student when you wrote it should not be a detriment; all such efforts are worth reading. I read that the Statute of Westminster 1275 c. 34 created the law of Scandalum Magnatum. Is that a contradiction to the first sentence of this post?